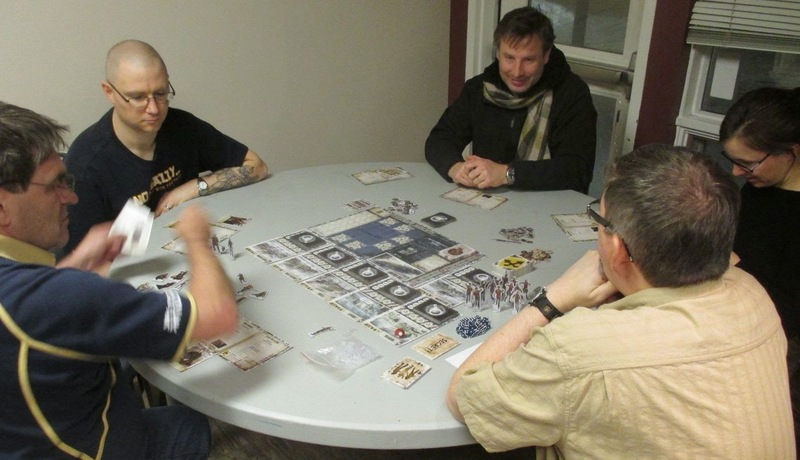 Bruce hosted me in two games of CCN on Tuesday, pulling out the new Prussian expansion for CCN. The key Prussian difference is related to morale: multiple retreat flags has a cascading effect on how far the units must retreat but the Prussians can also use their iron will chits to ignore flags. I don't recall the scenario, but it was a balanced one. Despite two French wins, the games were close. 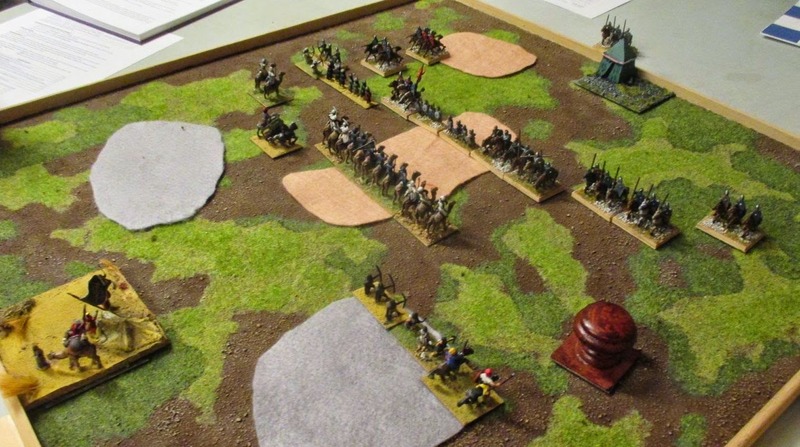 The Prussians (background) were reasonably well positions but the French could grab the two towns on the left or clear the woods on the right for victory banners. You can see (above) that I managed to use each of my units to their fullest (lots of single blocks retreating). The Prussian player could also gain a victory banner for each pair of units he moved off his own board edge (fighting retreat). Almost saw that happen once but the cards were cruel to the Prussians. Up next: A bunch more 54mm guys are finishing up and I am working on some 25mm Star Trek (???) figures. 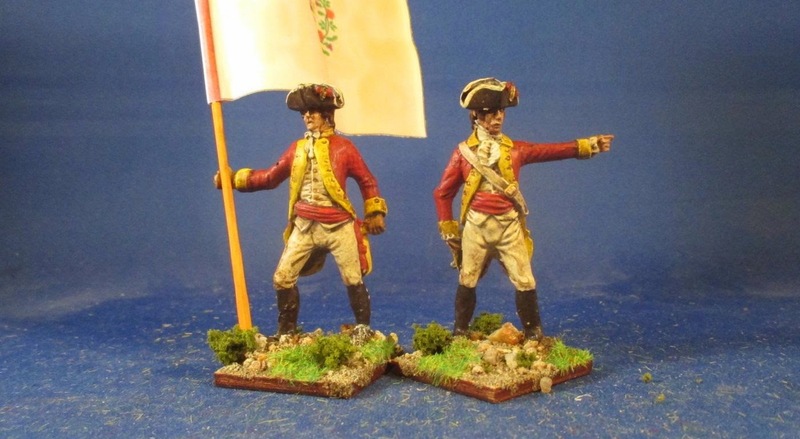 I hope to bring out some 54mm AWI to the club this week. Another battalion of 54mm British regulars are done (I'm gonna have to order reinforcements!) and ready for the table. These guys will see combat at the club next week. I did this unit with buff facings and turn backs. While washing these, I was so busy wicking excess wash from the turn backs that I neglected the front of the figures and one fellow appears to have executed a code brown (will need to do some repainting...). I also sealed them before the wash to keep the whites whiter. 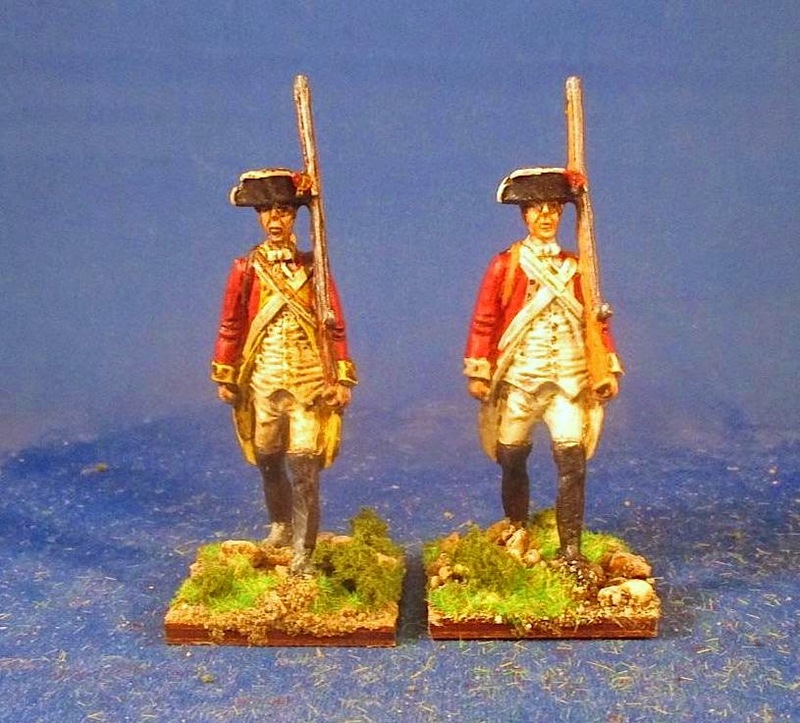 They looks less field worn than the earlier regiment I did. Up next: I have the command for these guys almost done. Then on to a general and some artillery. We had about 18 players out at the club last night with lots of variety. 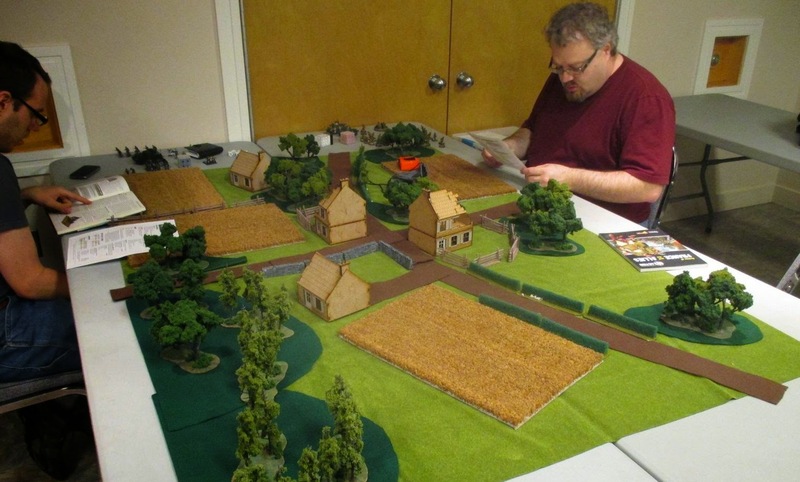 In addition to two games of Warmachine, Scott put on a game of Bolt action WW2. Scott was on about the "VD launcher" several times--some sort of French daly war melee weapon? There was DBA 3 plus some more zombie fun. 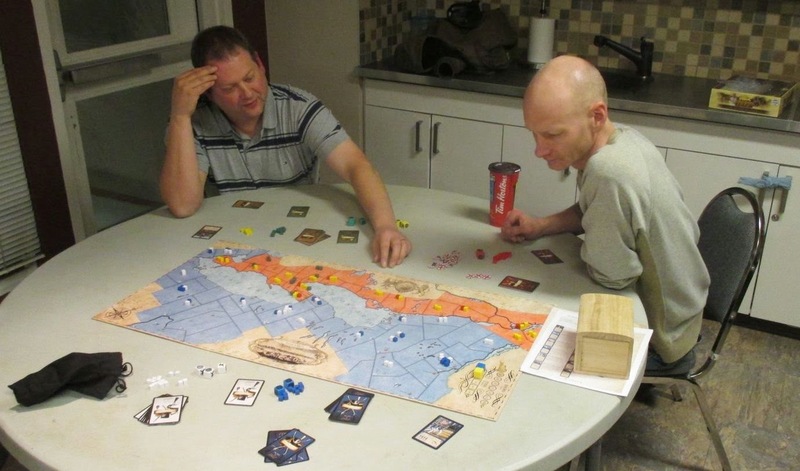 Justin and Wiley joined me for some 1812: The Invasion of Canada. We got three games in and the good guys only won the last game. Some interesting new strategies emerged, with the British striking south to bag Albany and some last-minute land grabs on the Niagara peninsula. Up next: Some more 54mm British regulars. 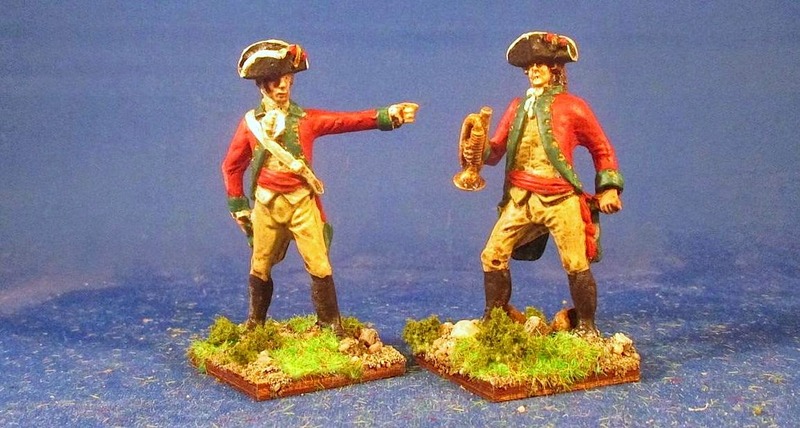 I finished the two command figures for the Grenadier unit I painted earlier this week. Overall, they are good. But, as I look at the photo, I see I (somehow?) put the frigging flag on upside down. Sonofabitch! An easy fix but a bit of a piss off nonetheless. 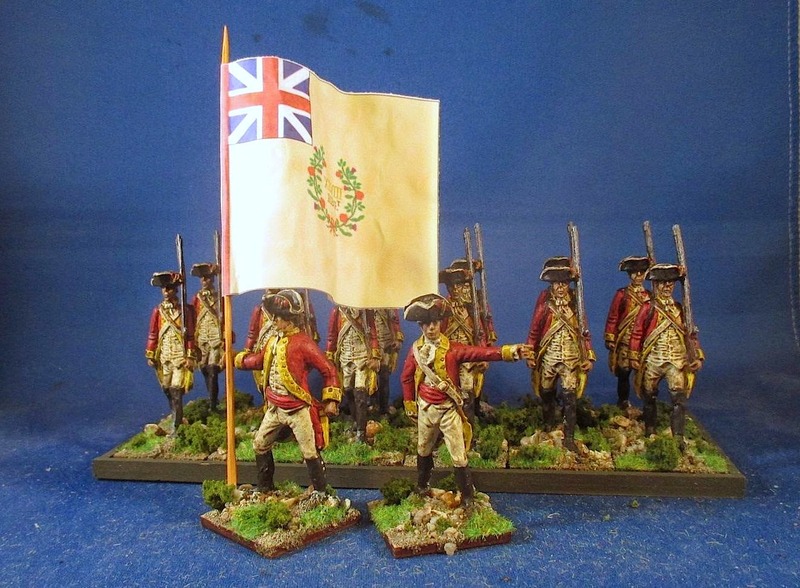 Up next: Some gaming with guys on Tuesday (maybe a Saratoga scenario) and then some more 54mm British Regulars. Need to sell of my 1/72 AWI guys to free up some shelf space! No gaming this week to I have been hard at work painting. 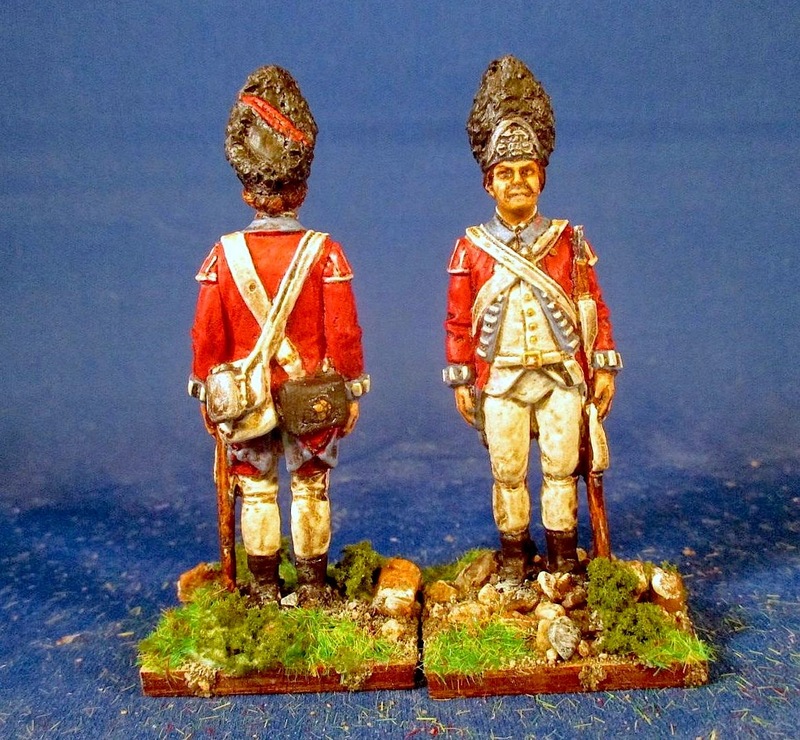 I finished of unit of 54mm British Grenadiers. 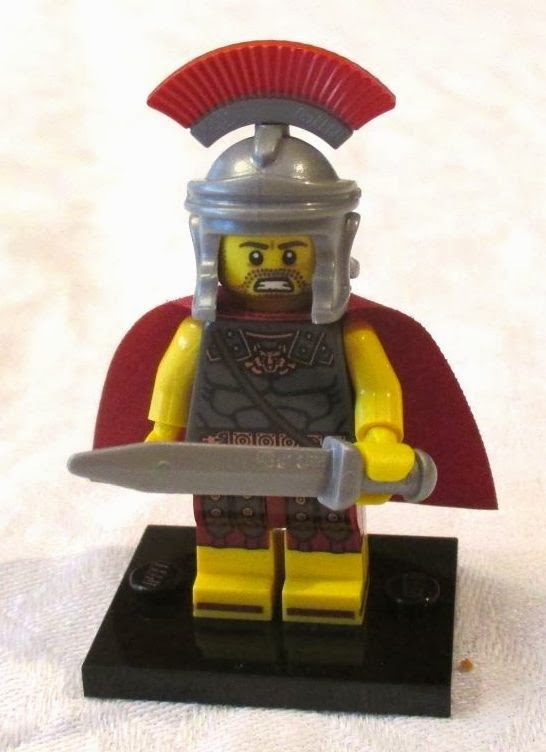 Figures are from All the King's Men and are quite lovely! I always like figures that trigger the camera's facial recognition software. These were a fair bit of work to paint. Simply a lot of detail and, with the rifles where there are, lots of opportunity for unintentional paint slopping to be fixed. I put a layer of future on these before I did the magic dip with the idea that the dip would not stain the white quite as much if it was already sealed. As you can see with the comparison below, this worked out. 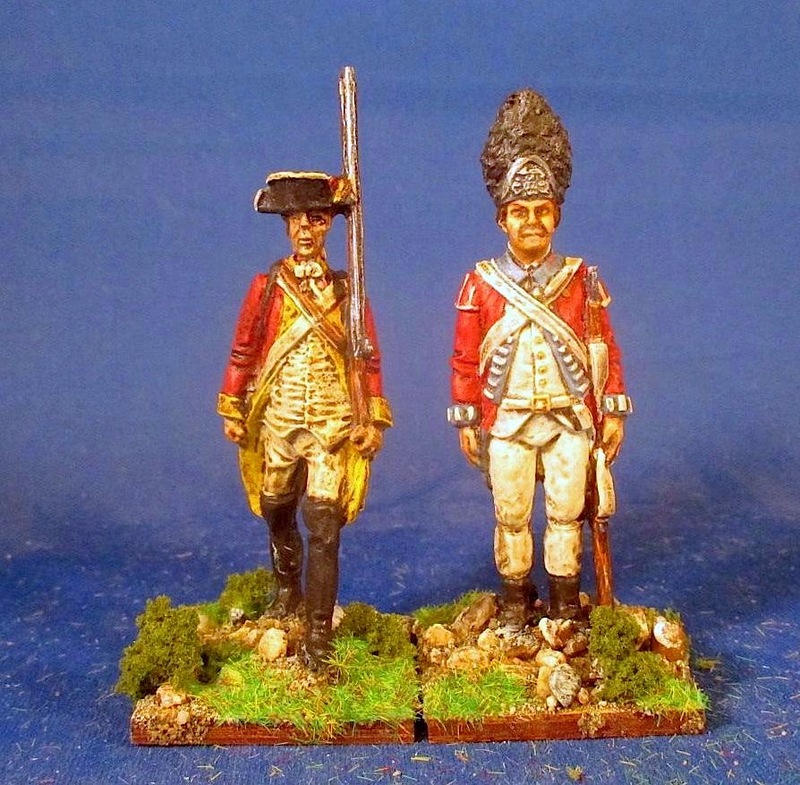 The grenadiers look parade-ground ready versus the more campaign look of the regulars. The grenadiers also look a bit more well fed! Up next: The command for the grenadiers are drying and I'm onto another unit of regulars so I can get them on the table at the club next week. I'm still working on finishing off units. In this case, I have down the officer and trumpeter figures for the unit of 54mm British lights I painted a few weeks back. These are All the King's Men figures. I like the trumpeter figure. 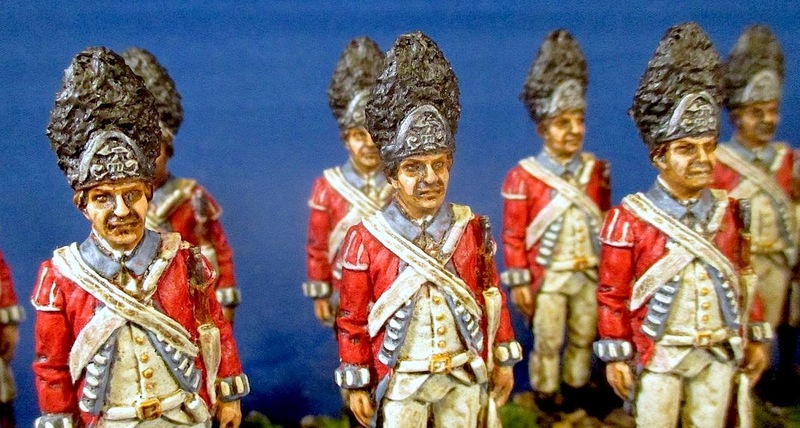 Up next: I have a unit of British grenadiers underway as well as a unit of British regulars looking on. And a general figure and another artillery unit. Hopefully I'll also get some gaming in with Bruce this week. We had about 17 guys out at the club this week with a huge variety of games. 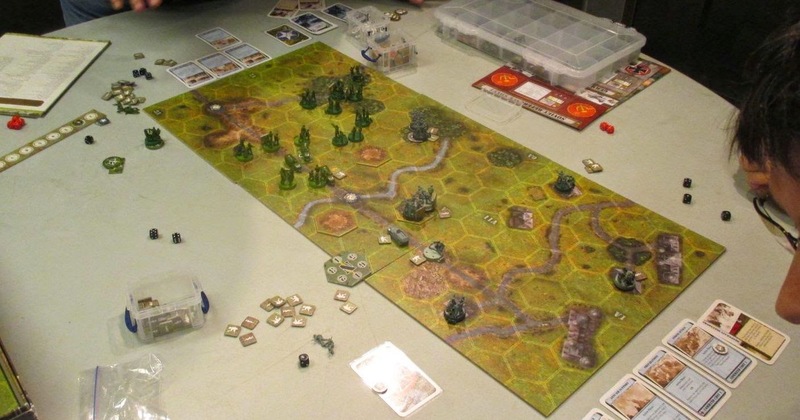 Neil and Dan played Tide of Iron (which I haven't seen out in a couple of years--I think). There was also a game of DBA 3.0. We had a pair of Warmachiners. 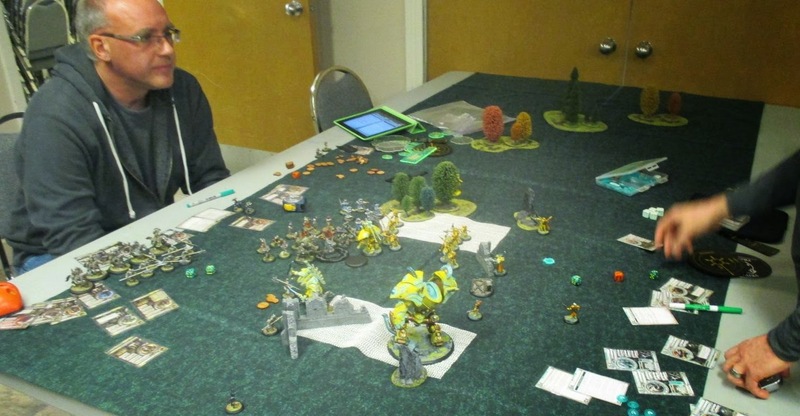 Terry hosted an ill-fated Zombie Game in the Depths of Winter. A double pulse by the Soviet armour the first turn combined with lousy dice on our side meant the Canadian left folded up. 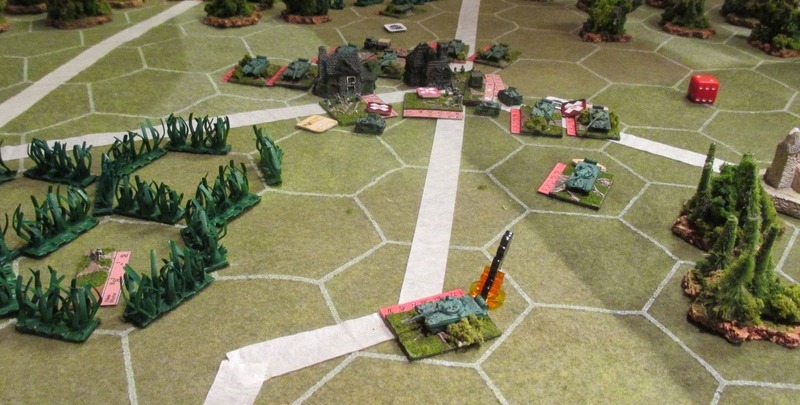 We were making some progress blunting the Soviet's advance by the end of the game (when we finally started to get average results out of the dice!) but I'd say it was a pretty clear win for our new Communist Overlords. A tough last night at the club for Andy who is off to the far east for a few years. 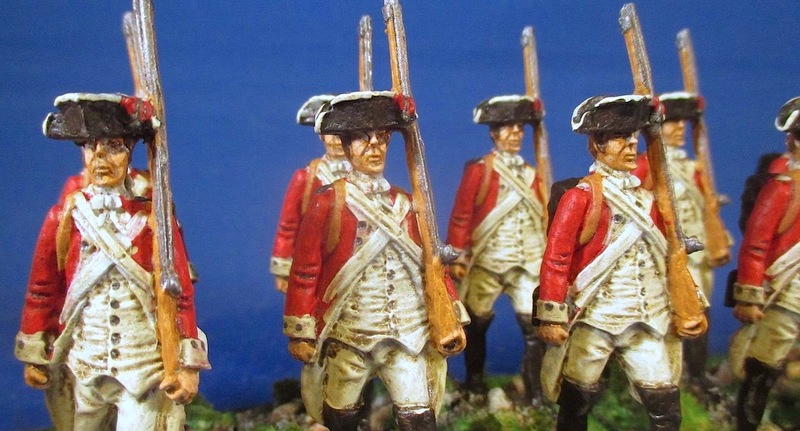 Up next: I have some more 54mm guy ready to show off and I am working my way through a bunch of British Grenadiers. 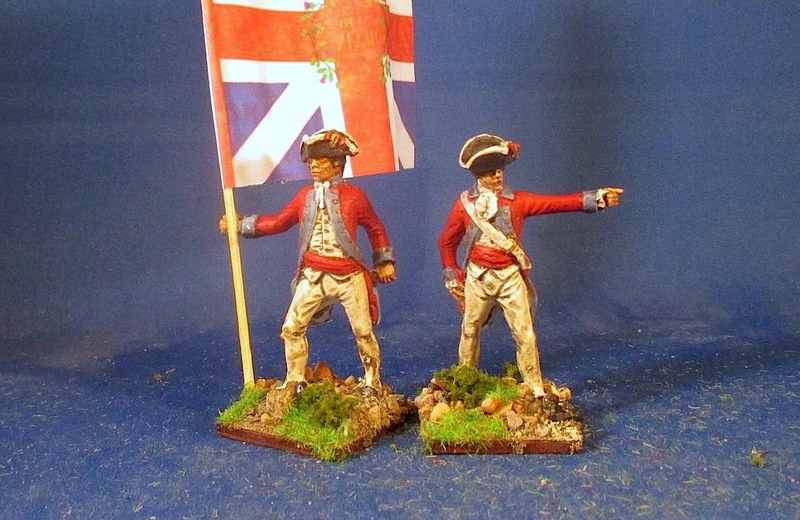 This week was a bit slow at the painting table with two 54mm British command figures coming off the line. 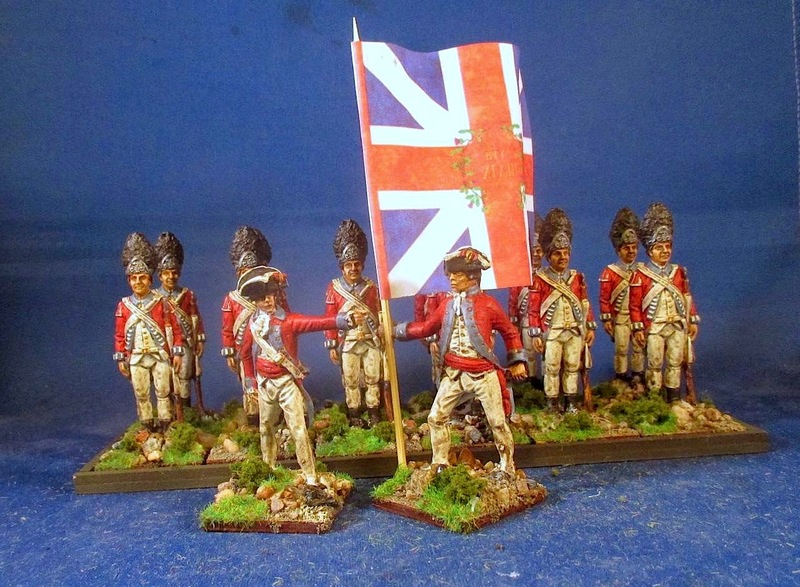 These fellows are in charge of the first unit of British regulars I completed this year. I pulled the flag off the internet, reversed the image to get both sides and printed. Up next: Club night is Tuesday!